Starting with a cute, adolescent pair of what turned out to be Utahraptors, and 18 unwitting volunteers, CEO and founder Dr. S Beckmann brought in highly sought-after [by local authorities], and somewhat skilled, scientists from around the country. These skilled craftsme... ok, these "scientists" or "craftsmen" were actually people who had seen the original "Jurassic Park" more than 20 times in the opening weekend. And yes, they were kinda, sorta, illegal immigrants, willing to do just about anything for $1.85/hr... but their combined knowledge was substantially more than your average 3rd Grader. Not today's 3rd Grader, but a 3rd Grader back then. SEMI-INTERESTING NOTE: At the time no one knew what a Utahraptor was. In fact, most of the surviving staff referred to them as "Ouchiesaurus" for years. At the time, Dr. Beckmann was working with animals he could only refer to as "Thingamasaurus" and "Whatchamacallitasaurus" because modern day paleontologists had yet to discover the species in fossils to officially name them. All he knew was - these "Thingamasaurs" were not finished growing when they reached 15 feet in length! 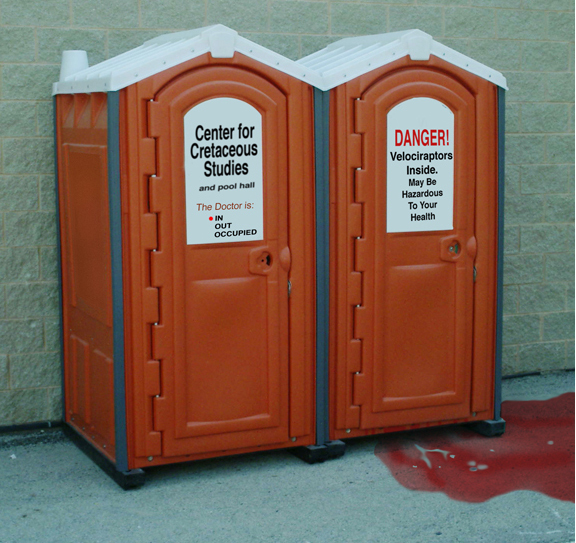 The first site of the newly formed Center for Cretaceous Studies, reportedly built just after the Pilgrims landed at Pearl Harbor, was an abandoned outhouse in DuPage County, Illinois. Though cramped, Dr. Beckmann and his 2 remaining, highly bandaged, volunteer staff continued to pore over the work needed to bring his dream into reality. Sharing the space now were 4 juvenile Whatchamacallitsaurs, 6 fully grown Eatoraptors, 4 juvenile Thingamasaurs, 2 Ouchiesaurs, 3 Whatzitsaurs, a dozen SomethingOrOthersaur eggs, a dial phone, a copy machine, a pin-up calendar of Miss Mesozoic November '72, five copies of "This Week In Paleontology", and a small refrigerator. Everything that moved - and most things that didn't - were chewed beyond recognition [including the two volunteers] in the first 12 minutes of The Center's official existance. The immediate move to more luxurious quarters was accomplished in the early 1980s following Dr. Beckmann getting himself unceremoniously booted from several museum-sponsored dinosaur excavations around the world. The move to a different location came about from the quick need for an unpublished address and unlisted phone number. Something still in effect today. Even with these measures, tC4CS staff continued to receive informational updates and tempting offers from Publisher's Clearinghouse. Back in those days, magazines were more abundant in the Visitor's Center than dust. Of course, back then the Visitor's Center was the size of a telephone booth. 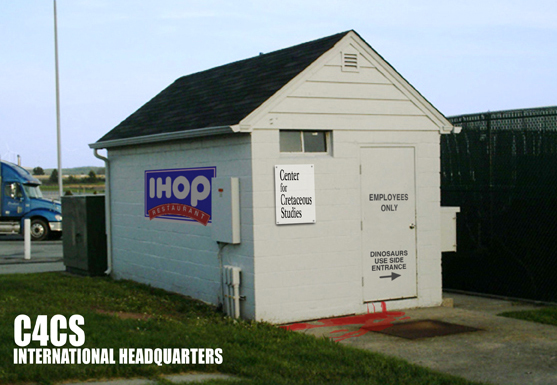 From there we moved to tC4CS International Headquarters, so-named because it was also a working storage shed for the local IHOP [International House Of Pancakes]. Now we had almost double the floor space- boasting more square footage than an average office cubicle. Also, our staff had their choice of pancake syrup any time of the day! From these hallowed halls, torn down by court order in 1985, came the breakthrough process still in use today for Dinosaur regeneration. And also in many third world cola drinks. Looking to quintruple the research facility size- to that of a double-wide trailer- tC4CS moved into it's first permanent building temporarily. As in: we moved in to the former "Joe's Drive-Up Liquor Store and Bait Shop" on a Friday afternoon, and after numerous hours of heated debate, which included Molotov cocktails and a purely [sort of] "accidental" release of the Raptors, it was "suggested" by a local "public awareness group" wielding 'suggestive' pipes, pitchforks, and torches, that we might possibly consider maybe perhaps vacating the premises/city/county PRONTO. Somehow tC4CS staff had to find a way to get rid of an entire store filled with liquor that night We didn't have a permit to transport alcohol. 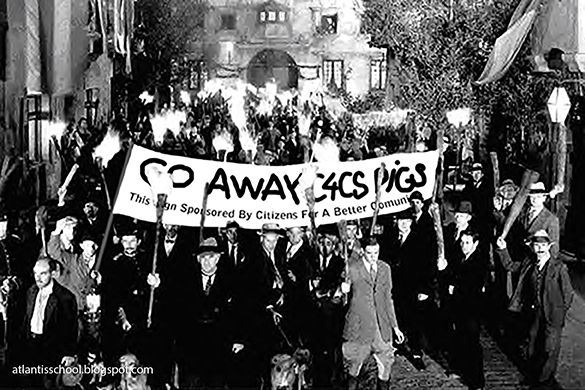 As a blinding, brilliant sun arose on Saturday morning, burning the retinas of the hungover C4CS crews whose mouths felt like a herd of Alioramus remotus had marched through them, the new "former" home of tC4CS was empty- just like every liquor bottle in the place. To this day no one can think of a reason as to why all the local pets were missing. Dozens of calls were attempted to our long ago disconnected phone number, claiming demolished doghouses with leashes no longer having "Fido" or "Spot" on the end. Cats were found stranded in trees 60 feet in the air. The final moving truck, filled with office supplies and one very hungover Carnotaurus [hey, you didn't think WE drank all the liquor, do ya?!? She blew a 32.2 on the breathalyzer before eating it] pulled out around mid-afternoon. This came only a few minutes after another accidental release of the Raptors into the mob at our front gate. 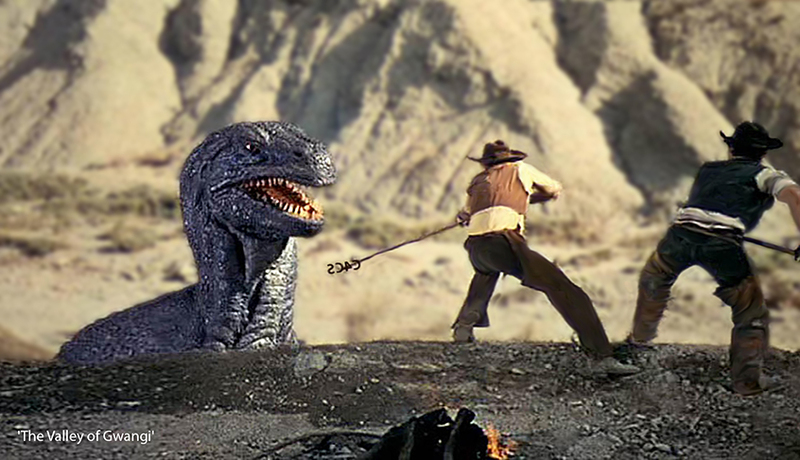 Again, as stated in all property lease records and subsequent court testimony: "it was not tC4CS's fault that Utahraptors are unable to comprehend the difference between disperse and dismember." 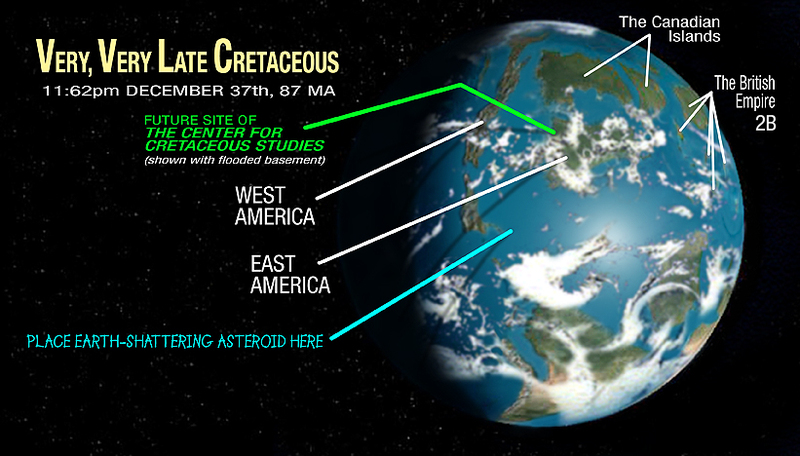 Today, or at least as of this writing, the 'new' and 'improved' C4CS World Headquarters, named in honor of the planet we are currently on, is by far our largest, most complete complex until we get another one. Secretly located 41 degrees 59 minutes, 18 seconds north longitude and 87 degrees, 54 minutes, 37 seconds west latitude (approximately), tC4CS Main Building has five floors, the top four dedicated exclusively to our corporate law offices. The Main Building is one of several dozen research buildings set on a serene college campus-like setting that belies the truth of what goes on around here. We have 13 area hospitals on speed dial. But that information is classified, so you didn't hear it from us. What you'll see when you visit is the redecorated front ticket office ['redecorated' after last year's 'visit' by 14 DinoResidents], very, very, very, VERY large indoor Paddocks (with limited exits), the world's ONLY negative three-star restaurant, a fantasticly overpriced Gifte $hoppe, a memorial walkway (for those who visited and 'departed' rather quickly, and not the way they intended), and an automated indoor Tour d'C4CS allowing you to see the ongoing research here at The Center. That is, when it doesn't break down or become engulfed in flames. For your safety, because if there was ever a place that required safety it would be a place with live Dinosaurs, over 158,345.2 ill-equipped First Aid stations are located next to the gun cabinet in every locked room throughout public access areas. HEY! That's Not Supposed To Be In This Picture! What's That Car Doing Parked There?!? 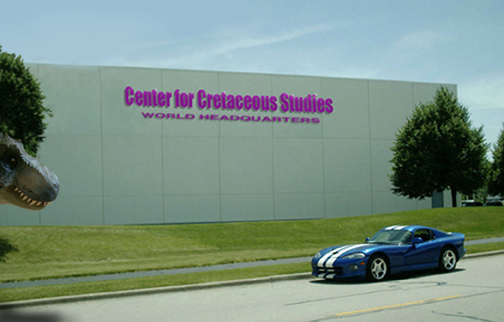 Since the early years right up to present day, visiting the Center for Cretaceous Studies has always been one huge sensory overload. Once you get acquainted with the surroundings, if you can get acquainted with the surroundings... once you lose your hearing from the constant bellowing of 40-foot Dinosaurs; once you lose your lunch from the smell of 40-foot Dinosaurs; once you soil yourself from the sight of 40-foot Dinosaurs, etc. etc... you and your family will absolutely love it here! Remember: every 5000th visitor gets a half-priced casket! Of course, that poetic description above is based on the fact that you and your family are still around. And if they're not around, or you're not, relax and know that you have followed thousands who passed on, er, passed this way, before you. CretaceouStudies@aol.com or CretaceouStudies@yahoo.com or CretaceouStudies@gmail.com TODAY!